The toddler years are really a busy time. Caroline is all over the place and isn’t the best at listening to her mommy. 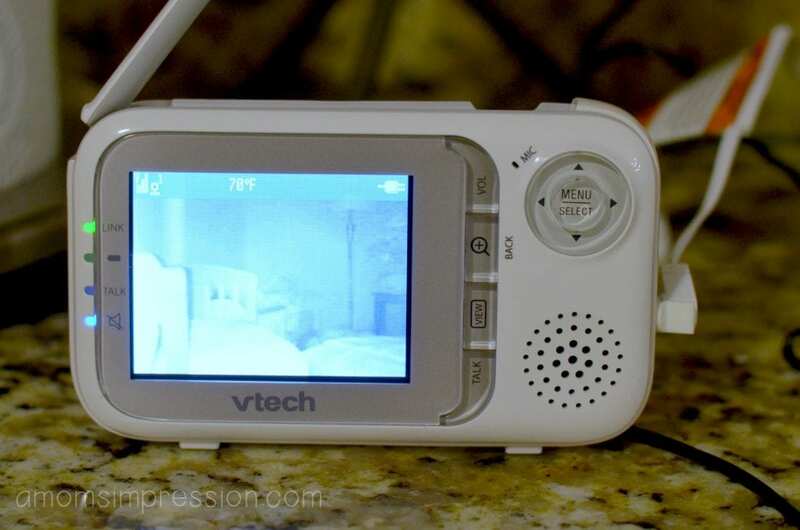 Thank goodness we have the Vtech Video Monitor that we reviewed when she was born. Not only was it a lifesaver when we moved her to her crib, it has been a lifesaver in recent months as she has tried to do everything at night except sleep. 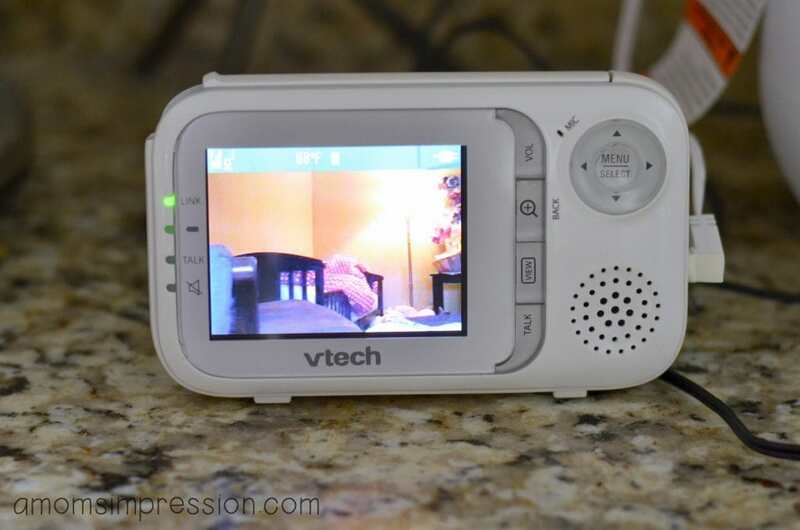 When we were given the opportunity to review the newest VTech Safe&Sound® Pan & Tilt Full Color Video Baby Monitor we jumped at the chance. We have decided that both kids need one in their respective rooms! Having a monitor in both our kids’ rooms allows us to watch them while they play on their own. In fact, we have moved one of the monitors into the play room so we can communicate with them. With the Talk-back intercom feature we are able to call them downstairs for dinner, or we can simply check on them if we hear a loud noise. The VTech Safe&Sound® Pan & Tilt Full Color Video Baby Monitor allows you to keep up with your little ones with peace of mind. If you have multiple children that you want to keep track of, the monitor is expandable for up to four headsets into the single parent unit. You can easily switch from room to room. I am thinking that we may keep this feature until they leave for college! This is the view at night in black and white. In full color with the lights on in the room. Pan, Tilt, and Zoom: Watch as your little one moves about. The camera pans up to 270 degrees side-to-side and tilts as many as 124 degrees up and down. Need more detail? The camera zooms up to 2x. Multiple View Options: System supports viewing of up to 4 total cameras from one parent unit. Viewing modes include single view (one camera only), split view (cycles through cameras on single view before stopping on split view) and patrol mode (single view that transitions to a different camera every 7 seconds). High-resolution 2.8-inch color LCD: Never miss a smile with the high-resolution, 2.8-inch color LCD. Full-motion video: With up to 25 frames per second, you can see your child’s every move on clear, dynamic video. Automatic night vision: Two infrared LEDs and a low-lux camera automatically detect dim light, providing clear video even in dark rooms. Some of the other features we love is the temperature sensor. We went through a time period when we first moved into our new home where we weren’t sure what the temperature was going to be like in the upstairs rooms. Having the temperature reading right on Caroline’s monitor quickly showed us that her room was a few degrees colder than the rest of the upstairs. We were able to adjust it for her. The kid unit is also wall mountable. When Caroline was a baby we used a Gorilla Tripod to hook it to her crib. Now that she is older we can just set it on her nightstand, but the ability to use it both ways is fantastic! If you would like one for your very own, you’re in luck! On Wednesday we will be giving 5 VTech Safe&Sound® Pan & Tilt Full Color Video Baby Monitors at our #VTechBaby Twitter Party! What: Whether you’re enjoying your infant’s sweet little smiles or admiring your toddler’s growing independence, we know you never want to miss a moment with your children. 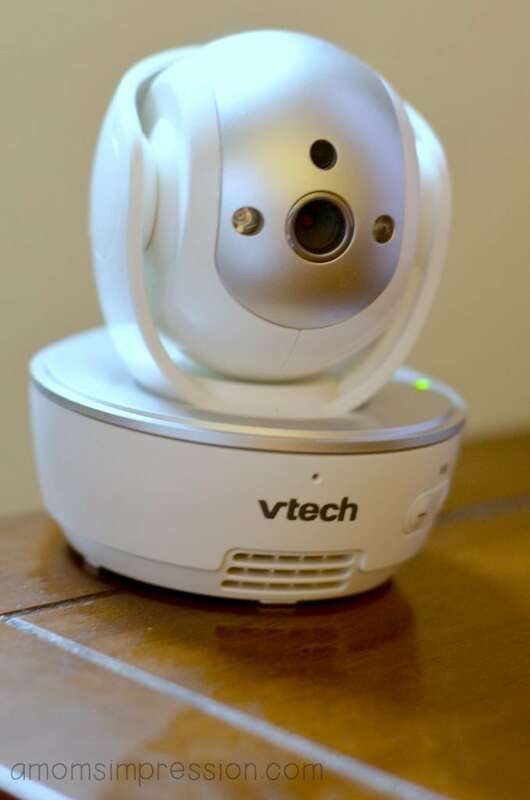 Thankfully, VTech’s Safe&Sound® Pan & Tilt Full Color Video Baby Monitor has you covered. With features like remote pan, tilt and zoom to scan your child’s room, automatic night vision and digital transmission that’s private and secure, you can be sure you know exactly what’s happening with your little one during naptime or playtime! Join me for a Twitter party to learn more about this amazing product and to chat about general baby and child safety tips! 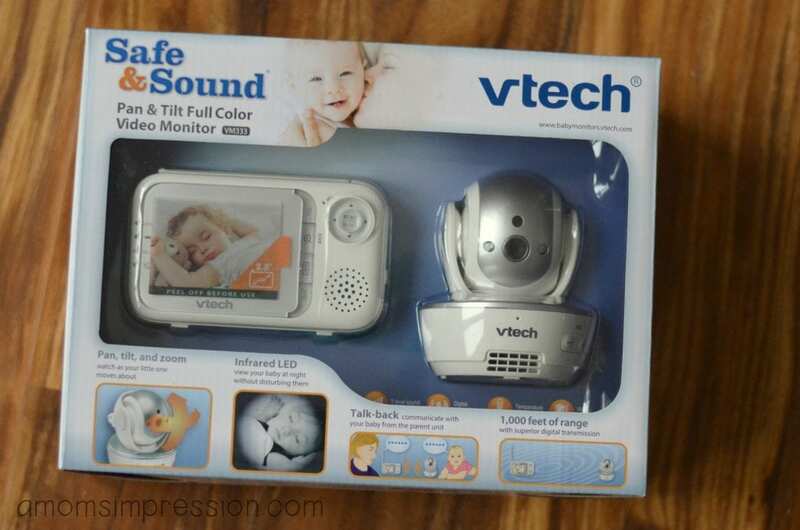 Prizes: During the party, we will be giving away five nursery safety baskets featuring VTech Safe&Sound® Pan & Tilt Full Color Video Baby Monitors to randomly selected participants who answer the trivia questions correctly. Prizes limited to U.S. participants only. Good luck, I hope to see you there! This post is brought to you by VTech and The Motherhood. All opinions are my own. I need a monitor like this. I didn’t think we would need one in a small two bedroom home….but I was totally wrong! !